Ever return from your long awaited holiday only to feel like you need another to recover from the first? Parents, we’re looking at you. Making sure the whole family stays entertained and happy can be a bit of a balancing act, especially when dealing with significant age gaps between the kiddos. Well stress no longer! With hundreds of activities to choose from, Dubai has something in store for families of all shapes, sizes and age ranges. Strictly for children, KidZania at the Dubai Mall is at the top of our list. We’re not kidding – they even enforce an “adults must be accompanied by a child to enter” policy! From toddlers to pre-teens, this award-winning children’s edu-tainment concept, featuring an interactive mini-city of life-sized streets, buildings and shops scaled down to a child-friendly size, is a guaranteed crowd pleaser. From jewellery designer to fireman to Emirates pilot, children can choose from dozens of professions to enact (in corresponding uniforms, of course!). Not to mention, children over 120 centimetres can be “checked in” to KidZania and left to the supervision of KidZania’s Zupervisors, so parents, enjoy that free time! 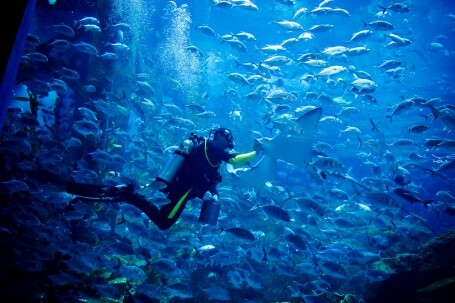 For all the mini underwater animal enthusiasts out there, the fish feeding at The Atlantis is a must-see. Held in The Lost Chambers every day except Wednesday and Sunday at 8:30 and 15:20, this feeding frenzy takes snack-time to a whole new level. Chill out on the scattered cushions and watch the underwater food chain in action. Small shark lovers won’t want to miss this! Speaking of animals, head over to the world famous Ski Dubai indoor ski slope, and treat your kiddos to the Penguin Encounter. With several packages to select from, participants can even swim with the lovable Gentoo and King penguins, after which you can warm up with a complimentary delicious hot chocolate! Or, if the idea of chilly temperatures isn’t going over so well, pack a lunch and meander on over to the flamingo roost at Ras Al Khor. Free of charge, the kids are sure to love watching the amazing pink birds by the dozen! Make sure to go at high tide for the closest view. If your children tend to lean more toward arts and crafts, why not take them to design and paint a commemorative plate or mug at Café Ceramique at the Jumeirah Town Centre Mall? Let their imaginations run wild, while you sit back, relax and grab a relaxing (and delicious!) bite to eat. Aspiring artists from the age of four can even try out their pottery skills. If your children have entered the joyous teenage years, keeping them entertained (and off their mobile devices) can be a bit trickier. Our solution: a desert safari. Who wouldn’t enjoy a sunny day packed with dune bashing, camel riding and sand boarding followed by an evening of henna and barbeque? Or, for the extreme sports enthusiasts, check out iFLY Dubai, an indoor sky diving facility, were no experience is needed, and fear of jumping out of a moving plane isn’t an issue! For the more cultured typed, Dubai is also home to the Global Village, open in the cooler months usually between October and March. Whisk your family around the world without ever leaving Dubai in a place where culture and customs are brought together for all visitors to experience (and purchase!). With plenty of amusement rides, games and a carnival-esque atmosphere, kids are sure to stay entertained and busy for hours. With these activities, and plenty more to choose from, Dubai is the perfect place to spend your family holiday. Whether you’re looking to join in the activities or keep the younger ones occupied so you can snag a little bit of free time, Dubai has you covered. Emirates takes special care of its young flyers, beginning on the ground with priority boarding for families, baggage drop-off 24 hours prior to your flight and complimentary strollers at Dubai International Airport. Once onboard, children traveling in all classes have access to our award-winning inflight entertainment system, ice, which features over 25 dedicated TV channels for youngsters and 40 class Disney movies. This, in addition to our Fly With Me toys and our special, Lonely Planet Kids Packs for older children are sure to keep your young flyers occupied for hours. Emirates meals are also specially catered to appease the taste buds of even our youngest passengers. Flyers between two and 12 years old, can select from a range of kids’ favourites, and enjoy our complimentary snack box filled with treats to enjoy along the journey. The daily Emirates Prague-Dubai route, serviced by an iconic Emirates A380, operates as EK 139, departing Dubai at 0905hrs and arriving in Prague at 1325hrs. The return leg operates as EK 140, departing Prague at 1555hrs and arriving in Dubai at 2355hrs.